Randolph’s Liberty Tree, one of twenty-six designated historic landmarks in and around town, has seen better days. 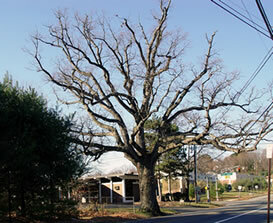 The white oak tree, located behind the bank near the southeast corner of Quaker Church and Center Grove roads, dates back to about 1720. It is the last tree in town that was left after the Revolutionary War. Last year, Randolph Township Landmarks Committee member Carla Bortnick reached out to Dr. Tom Ombrello, a professor at Union County College who specializes in propagating old trees. Dr. Ombrello offered to try to grow a new tree from the acorns that came from Randolph’s Liberty Tree. The tree did not produce a great deal of acorns in the past eight or nine years but after a wind storm in the fall of 2013, committee member Meg Sullivan was able to gather about a dozen acorns from it. Dr. Ombrello determined that one of the acorns was viable for growing and it was placed in a cooler to simulate a winter environment. He recently notified the committee that the acorn has germinated! It will remain where it is for a few more months and then be brought into a greenhouse. Since the white oak is one of the slowest growing species of trees, the most the seedling can grow is a few inches each year. 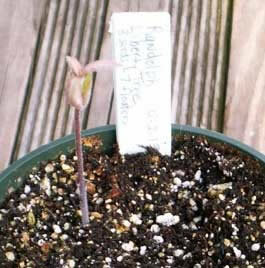 Thus, Dr. Ombrello has recommended that the tree seedling be given a protected environment for at least a few years before it is placed outdoors. The landmarks committee has toiled over the years to care for the Liberty Tree and committee members are hopeful that the seedling will thrive so that it can be planted and become a living legacy for future generations of Randolph residents. The original Randolph Liberty Tree will live on through its offspring!